The first post of the season is a little overdue, but it’s here now. It’s been an interesting start to the season. When we flew in on the 22nd, May, we flew through a blizzard. 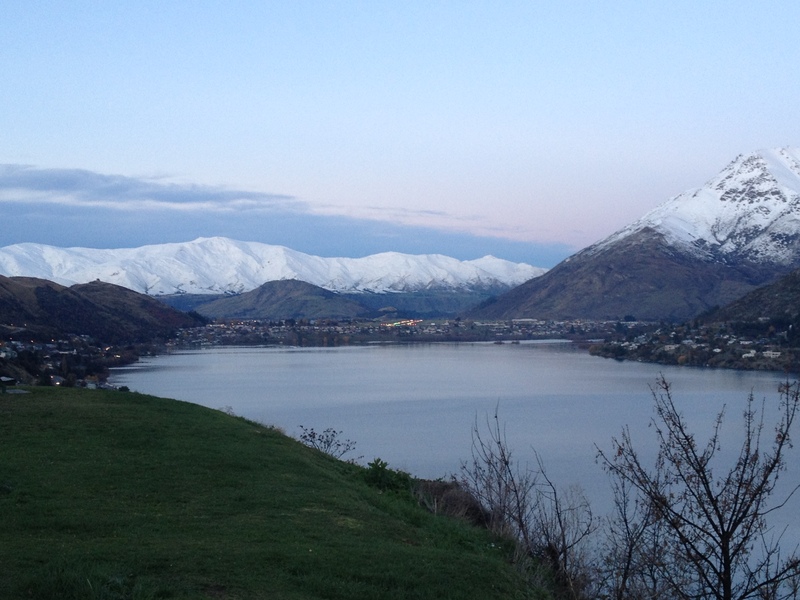 The Remarkables and the Southern Alps were covered in snow, Coronet Peak opened on time and it looked to be a very promising start to the season. However, rain and constant warm temperatures slowly but surely reduced the snow pack, leaving the lower mountain and beginner areas bare. Coronet Peak remained closed for two and a half weeks, from the 22nd June through to 9th July, re-opening just in time for the NZ School Holidays. 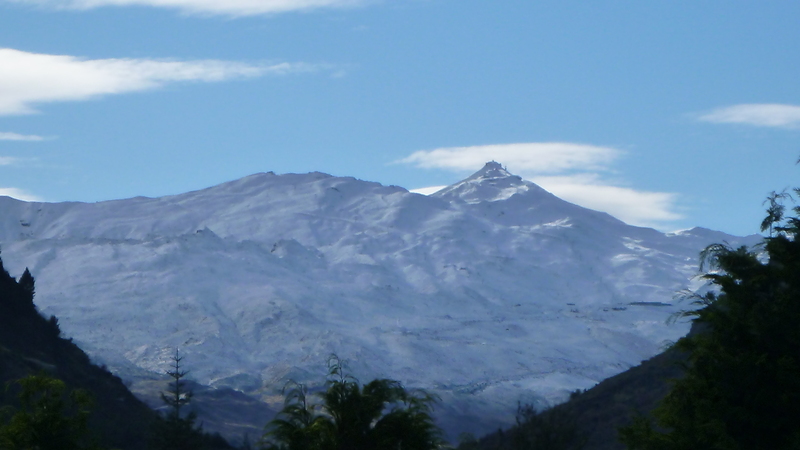 During this time I was on the Trainers Cert workshop at Cardrona for the first few days, then worked across the valley at the Remarkables, which was nice for a change of view. I have worked there before on an ad hoc basis at the end of the season a couple of years ago. The Coronet Express started spinning at 8:00 am on Saturday morning, 9th July for First Tracks pass holders, with the other lifts operating into the evening, including the beginner conveyors and the Meadows chair, providing access to the Big Easy. The Greengates chair continued to run for sightseeing and tubing from 10:00 am – 3:00 pm, giving the chance to soak up stunning views from the Ice Bar. Night Ski also kicked off for the season on Saturday from 4:00 pm and from all accounts it was an awesome night with the airbag on the deck, a DJ spinning tunes and warm braziers burning. Unfortunately, we have no control over the weather, but, this should be the start of a Colder Low pressure weather system that has a few cold fronts and southerly winds later in the week. Hopefully, winter is here to stay! Sport has long been considered part of a country’s psyche, with its respective national sport, state, province, region or county with respective teams and each town with it’s club. Professional or amateur, there is something about sport that brings people, and the community, together. Sport has a broad meaning that includes all sorts of physical activities. It can be outdoor or indoor and organised/competitive or casual sports. Soccer, Rugby, Basketball, Netball are examples of competitive sports. Other pursuits such as Dancing, Ballet, Jazz Ballet, Martial Arts, Gymnastics, Swimming, Running, Horse riding can be competitive, social or a mixture of both. Outdoor adventure pursuits such as hiking, mountain biking, kayaking, climbing, canyoning, abseiling, surfing, kite surfing, wind surfing also count as sport, as long as there is frequent participation. Although not necessarily sport, as such, Physical Play is not to be under estimated for it’s benefits, either. Skateboarding, roller blading/skating, rip sticking, though not in a team/organised setting have their benefits, as opposed to video games and chess which are sedentary. They mainly exercise the mind or hand eye coordination and reflexes. We engage in the most play, or sport, during the times of our lives when the educational demands are the highest. Play has been defined as ‘voluntary, has no obvious survival value or is apparently purposeless, is pleasurable or fun, creates a diminished sense of time and self consciousness and is improvisational.’ (Hargrove, T 2011). Being voluntary and fun are important for children to maintain motivation for participation in sport, as a distinction from participating to win. And ‘a diminished sense of time’ basically means that ‘time flies when you’re having fun’, which has been known to distress some children because they don’t want the fun, or game, to stop! Sport and physical play are important for creating and developing body awareness. Most children in lessons will know, generally, what the different parts of their body are called. However, this doesn’t mean that they know how to tell that part what to do. The classic example is when a student is learning how to stop for the first time. They have been taught that making a wedge (aka slice of pizza or slice of anything circular or any thing that resembles a triangle) will make them stop. Then once sliding, they put their hands together and nothing happens with their feet and skis. This demonstrates a good cognitive understanding of what it is they need to do, however, their arms and hands have been used with more dexterous activities and receive the message first. The development of physical and motor systems start from the head and work their way down and is referred to as ‘Cephalocaudal development’. (McInerney & McInerney, 1998) Since it is a new neural pathway being forged to their legs it takes a little more effort to make it happen. From experience, this happens in both adults and, more so in children. When teaching skiing, there is a noticeable difference between athletic, or physical, and sedentary kids. Children who are active in a lot of sports, or highly active in one, generally pick up snow sports quicker as they have more active neural pathways, resulting in improved coordination. ‘A child whose brain has more neural pathways will be able to learn more easily.’ (Johnston & Ramon, 2011) The best time for these pathways to be developed is between 3-6yrs. Skiing involves the use of muscles that don’t get used in everyday life. And being a sliding/balancing sport, requires the use of the smaller stabiliser muscles in both the lower and upper body to maintain balance. The muscles used in a variety of activities such as skateboarding, roller blading/skating, rip sticking greatly improve a child’s (and adults) ability to develop balancing skills and then reappropriate these skills to skiing. Working in Canada, it’s interesting to see how quickly kids pick up skiing if they play ice hockey, or at least ice skate. There is a dramatic and noticeable difference between those that do, and those that don’t. Developing these muscles, along with on mountain skiing experience, allows us to apply and adapt what is known as Perceptual Motor Skills. Perceptual motor skills could be described as the difference between learning to read and learning to write. (Johnston & Ramon, 2011) It’s one thing to know how a letter looks, what a letter or word is. It is another to be able to write the letter, or word, and coordinate what it looks like, or sounds like, to the movement pattern of the muscles in the hand and fore-arm. Perceptual-motor skills also apply in other sports that involve the timing of catching, hitting, kicking or throwing a ball. These help to create and develop spatial awareness which is important when skiing in a variety of situations. When skiing in a class line, younger children have a tendency of crashing into each other, either while skiing or when stopping. Sometimes it is amusing to watch, although with older kids can be quite scary. The timing and coordinating of a pole plant or the gauging of jumps, ie. where the take off and landing are in relation to each other, which then determines what speed is needed. Perceptual-motor skills means that we are able to see the terrain or conditions and adapt, and anticipate our movements accordingly. How we ski in the bumps is going to be different to how we ski on the groomed. And like wise, how we ski in powder is going to be different to how we ski on firm, almost impenetrable snow. Perceptual-motor skills are closely related to Proprioception. While being physically aware of others around them is important, so is knowing how to socially interact with those around them. Playing team sport has the benefit of allowing the interaction and development of positive and valuable relationships with others their age, as well as other adults, coaches, trainers and parents of other team members. As a child gets older a sense of ‘us’ is developed, being able to share and take turns. Seeing where a child is in its’ social development is demonstrated in many ways. The two more distinct ways are separation from their parents and the importance of where they are in the ski school snake. The former is evident in the younger ages (3-6), while the latter is more evident in the 6-8 yr old age range. Playing team sports exposes children to the highs and lows of life through winning and losing. Being humble in the win and gracious in defeat, a sense of sportsmanship and egalitarianism can be instilled by being part of a team. Interacting and communicating with other team members can result in a successful team. Once children have seen that positive interaction can lead to positive results, the desire to cooperate with each other is heightened. The sense of belonging to a group and being able to contribute to the team’s success can improve their self-esteem and self-worth. In this process leadership skills can also be developed. The relationships and teamwork involved with playing sports has other benefits. Solving problems and either defending or attacking on the field develops the mind through strategic thinking. Practising plays to get past or through the opponents defences, and then to be able to create variations to counter what’s in front of them allows them to learn how to think on their feet under perceived pressure. Instances of thinking strategically in skiing include navigating through the trees, race gates, or congested runs. Determining one’s own speed, the speed of others, the spacing between trees, gates and people all contribute to the child’s ability to think on their feet. Trying to think how the opposition, or others, thinks also helps develop empathy. In a ski lesson, an instructor was heard to say to his student, ‘Do you know why we fall over?’ ‘It’s so we can learn to pick ourselves up, again.’ A lot of the time a child only needs moral support to get up…..after you’ve walked half-way back up the run to help them. The skill of emotional self-regulation is developed and honed in the theatre of sport. This is one of the reasons that parents put their children in to ski lessons, as they either don’t have the patience or they find themselves always physically helping their child, rather than emotionally encouraging them. Some of life’s little lessons are learnt through sport and play. And not necessarily high consequence lessons, either, but rather lessons that aid the personal development of the child. Exploring and learning things for themselves, through trial and error. The more experience they have of cause and effect, the more likely it is that they are developing an awareness of themselves and their surroundings. Skiing is a versatile sport that you can compete in various disciplines, train to improve technique, go on week-ends by yourself or on holidays with family or friends. Skiing is a sport that can represent so much, to so many. There are not many, if there are, sports like it. For those that live near a ski resort, skiing can be structured weekly training/lessons or recreational fun, for those that go skiing on holiday it would more likely be recreational fun and exploration. The benefits of sport improved Physical Coordination, Socialisation, Academic Improvement and Personal Development are enhanced significantly through the Theatre of Sport and can afford a more holistic development of the child. Skiing also lends itself to the positive development of children and the participation of other sports lend itself to the development of their skiing. McInerney, D.M & V. 1998. ‘Educational Psychology: Constructing Learning’ Prentice Hall.